The largest of all terriers, the Airedale Terrier was originally developed to hunt otter, although it is capable of capturing other prey as well including fowl and rats. It can also be used to track deer and as a gundog. The Airedale Terrier has a wide range of secondary roles such as army messenger, police and guard dog. 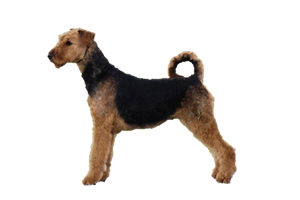 It is believed that the Airedale Terrier is descended from the extinct Black and Tan Terrier and was developed in the valley of Aire in England. It has been suggested that this ancestry is shared with other terriers, including the Irish, Wire Fox and Welsh. The Black and Tan was used by Yorkshiremen to hunt fox, badger, weasel, otter and other small game, and while they excelled in many areas, it was thought that they lacked the keen nose and swimming ability of the Otterhound. The two were crossed and made the basis for the breed, other dogs were undoubtedly added, and examples closely resembling today's dog were in place by the late 1800s. In 1902 there was a movement to delete the word ‘terrier’ from its name, due to the fact that it was too large to go to ground, but as the Airedale remains a terrier in all other aspects it did not succeed.